Today is Holy Saturday. We anticipate the Resurrection of Jesus Christ. In the evening, the faithful gather outside of their parish. The Easter Vigil is about to take place. A fire is lit and blessed. 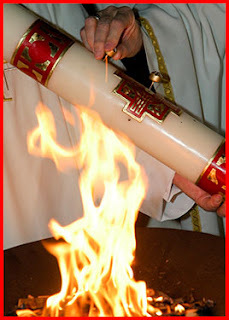 The priest or deacon holds a large candle called the Paschal Candle. The candle goes through a ritual of preparation. Wax knobs are placed within the cross engraved in the candle symbolizing Christ's 5 wounds. The priest then traces the cross reminding us that Christ is the beginning and end, all time belongs to Him and to Him be all the glory and honor. The priest then lights this candle as a sign of Christ's light that will light the darkness in us. The candle is then taken into the Church building and the priest or deacon says, "Christ our light" while raising it high. All response, "thanks be to God." All present have smaller candles. They then light theirs from the Paschal candle showing this transfer of Christ's light to them. The Church is pitch black, holy water fonts are empty. It is like entering an abandoned building that has no signs of life. As all process with their candles and the larger flame of the Paschal Candle enters closer to the sanctuary, the Church building starts to show signs of life, so to speak. The Exsultet is now sung which is the Church's proclamation that Christ has risen. The Gloria is then signaled, all the lights of the building are lit, the Church bells rings. Jesus Christ has risen! The Liturgy of the Word follows and then the Rite of Baptism where we renew our Baptismal vows. The Catechumens and Candidates who have prepared to received the Sacraments of initiation (Baptism, Confirmation, Holy Communion) are brought forward and receive them. The rest of the Liturgy continues as a regular Sunday Mass would. This is considered one of the most beautiful Liturgies in the Catholic Church. Everything about it speaks to every sense of the human body. We see the darkness and lights, hear the chants and bells, smell the incense, touch the wax and feel the heat of the Paschal candle as fire is transferred and the holy water as it is sprinkled, we taste the Holy Eucharist. Jesus is Risen and this Liturgy shows it well.